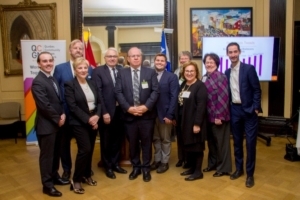 The Quebec Community Groups Network connected with Members of Parliament and Senators last week as we hosted our annual event on Parliament Hill. This was a unique opportunity for our Parliamentarians to better understand Quebec’s English-speaking community – one of two official language minority communities in Canada. Members of the QCGN Board and Network, as well as stakeholders, took part in the cocktail where community members were able to discuss their needs and concerns with our federal representatives. With multi-partisan representation from the House and Senate, including most of the members of the House of Commons Official Languages Committee, we discussed modernization of the Official Languages Act; the government’s review of the Official Languages Act; as well as the implementation of Canada’s Action Plan for Official Languages. QCGN is advocating for a modernized act that will better serve the interests of English-speaking Quebec and advance official languages in the years to come. We want the act to emphasize the principle of equality of status of English and French and ensure that it adapts to the specific contexts and needs of both official language minority communities. We told our federal representatives that we are pleased with proposed amendments to Official Languages Regulations that were announced by Treasury Board President Scott Brison and Official Languages Minister Mélanie Joly on Oct. 25. These changes would increase the availability of federal government services in English to our community and guarantee the voice of local communities in determining the language obligations of specific points of service. We also encouraged our representatives to support the effective implementation of the federal government’s Action Plan for Official Languages – 2018-2023: Investing in Our Future. Released last March, the plan increased funding available for organizations serving English-speaking Quebec and established a $5-million development fund to help our community organizations find sustainable ways to deliver services to English speakers in various regions and sectors.  QCGN and its Priority Setting Steering Committee, were mandated by the Minister of Official Languages to work with the Department of Canadian Heritage to make sure that the Plan is implemented in partnership with the community sector serving English-speaking Quebecers in a way that will meet the needs of our Community of Communities. (Read details further in this newsletter.) Also among our guests were Official Language partners including Commissioner of Official Languages Raymond Théberge, and the top brass of the Fédération des communautés francophones et acadienne (FCFA) including President Jean Johnson, Board member Justin Johnston and Director General Alain Dupuis. Their presence gave us an opportunity to discuss and condemn the recent decision by Ontario’s Conservative government to abolish the Office of the French Language Services Commissioner and cancel plans to create a new French-language university in Toronto. (More about this later in my column.) The QCGN extends its warm appreciation to Mount Royal MP Anthony Housefather and Senator Judith Seidman for inviting their colleagues and helping us host the event on the hill. The political landscape here in Quebec has changed since our last newsletter in September. For the first time since 1970, a party other than the Liberals and the Parti Québécois is governing Quebec and the QCGN is making connections with our new government to effectively represent English-speaking Quebecers. Following the election, the QCGN congratulated Premier Legault and said we are ready and willing to work with him and his new government on key issues such as health and education. (Read our press release.) During the campaign, the QCGN and its members met and spoke with many candidates from our new government. That included Sainte-Rose MNA Christopher Skeete, who was subsequently appointed as Premier Legault’s point person with the English-speaking community. We recently met with Skeete, who is the Premier’s Parliamentary Assistant in charge of the Secretariat for Relations with English-speaking Quebecers and offered our assistance so that the new CAQ government can better understand and represent the interests of English-speaking Quebecers across the province. Among the topics we discussed were guarantees that ensure access to health and social services. With the CAQ’s stated goal of eliminating school boards, I also joined Townshippers’ Association Executive Director Rachel Hunting for a meeting with Brome Missisquoi MNA Isabelle Charest, who is the parliamentary assistant to Education Minister Jean-Pierre Roberge. Charest and her team were keen on getting the word out that her new riding team is fully bilingual and encouraged Brome-Missisquoi residents to touch base with them on the issues that are important to them. We also spoke informally about her new responsibilities in education. In the middle of the tumult over language, the QCGN was invited to present at a meeting of Fédération des Communautés Francophones et Acadienne du Canada members in mid-October. Our Director General, Sylvia Martin-Laforge, and our Director of Community Development and Engagement, Lynda Giffen, made a presentation on the QCGN’s mandate, history, membership, and priorities to minority language group representatives from other provinces as well as national organizations supporting youth, seniors, jurists, women and parents. Participants acknowledged that the English-speaking minority in Quebec and French-speaking minorities in Canada and were effectively in the ‘same boat.’ Participants discussed opportunities to work together given our similar mandates supporting minority language communities, notably within the framework of the upcoming 50th anniversary and modernization of the Official Languages Act. 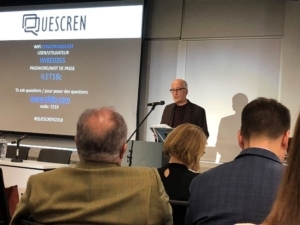 Later in the forum, I was pleased to participate on one of the panels with Russell Copeman, the new executive director of the Quebec English School Board Association (QESBA) on Oct. 28. Our topic was how to ensure the vitality of our minority language community through education. During the discussion, I said that English-speaking Quebecers are not focused on preserving their language, rather, we are concerned with the role schools play in protecting and preserving our unique culture. Russell noted that education is a key component to maintaining our communities, particularly those that are small and precarious. He said the ingredients needed for our communities to be vital are: a quality education for our young people; and that we prepare our youth to be able to live and work in Quebec through adequate French second language instruction. Russell said the missing ingredients are: more students; more teachers and professionals; curricula better adapted to our reality, and funding that meets the particular needs of our boards. Both Russell and I noted that there is a broad consensus in our community that the continued existence of locally, democratically elected school boards are a necessary and vital element of our community’s vitality. 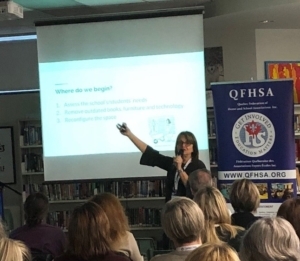 I was also on hand with QGCN’s new Director of Community Development, Lynda Giffen, for the annual conference of the Quebec Federation of Home and Schools Association (QFHSA) at St Thomas High School in Pointe Claire, Que., on Nov. 3. The conference featured an inspiring keynote by Marie Wahba on the re-invention of school libraries by the director of educational services for the Lester B. Pearson School Board. 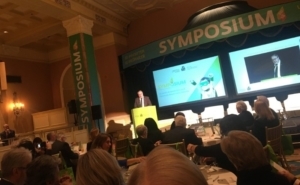 Wahba spoke to the evolving and changing role of schools as places of innovation and the introduction of new technology in the learning environment. Her presentation discussed innovative ways to reinvent library spaces into ‘learning commons’ that incorporate learning spaces and technology in creative ways. Over the last few months the QCGN has welcomed two new members including the aforementioned Saint Columba House and Catholic Action Montreal. Founded in 2015, Catholic Action Montreal is a service organization whose mission is to match the community’s specific needs with volunteers’ expertise in the English-speaking Catholic community and the community at large. They bring together English faith-based organizations with a common cause and a shared commitment to better serve people in the greater Montreal area. “Serve our Neighbour” is the motto and a vital component of outreach services, requests for assistance, and projects undertaken that have impacted Montreal’s English-speaking Catholic community. Saint Columba House, a not-for-profit organization that has been serving the English-speaking community of Pointe Saint Charles and beyond for 100 years providing a variety of programs and services to meet the needs of children, youth, families and seniors. Celebrating 100 years of service primarily to the English-speaking community of Pointe Saint-Charles, Saint Columba House is engaged in seeking justice through empowerment, education and social action to address social and economic injustice through actions, reflection and analysis, community organizing and advocacy. Our QCGN family will be getting together as the QCGN staff hosts its fifth annual Holiday Open House and Breakfast. This QCGN tradition is coupled with a small fundraising activity for one of our members or partner organizations. This year, staff has chosen to raise funds for the Community Lunch Program at Saint Columba House, QCGN’s newest member. Starting at 8:30 a.m. on Dec. 10, our QCGN elves will be brewing coffee, serving homemade goodies to our members, partners and stakeholders who are invited to share some holiday cheer and make a contribution of cash or non-perishable to support the Community Lunch Program. The program offers Point St. Charles residents and guests hot, nutritious and balanced lunches prepared fresh daily by the lunch program staff and volunteers. Up to 125 lunches are served each day to community residents and program participants. For many low-income people, this is often the only nutritious meal they will eat for the entire day. If you cannot attend but want to show your support for St. Columba House you can drop off a donation or send a cheque to 2365 Grand Trunk, Montreal, Que., H3K 1M8. You can also donate online by clicking here. If you are planning to drop in, please click here and let us know. The federal government’s Action Plan for Official Languages – 2018-2023: Investing in Our Future increased funding available for organizations serving English-speaking Quebec and established a $5-million development fund to help our community organizations find sustainable ways to deliver services to organizations dedicated to enhancing the vitality of Quebec’s English-speaking minority communities. The new $5 million fund is in addition to a boost in baseline funding for official language minority organizations across Canada which increases the Cooperation with the Community Sector – Development of Official Languages fund. As English-speaking Quebec’s official interlocutor with the federal Department of Canadian Heritage, the QCGN was asked to identify core principles and priorities of action and a framework for the distribution of the additional funding being made through these envelopes. The Priority Setting Steering Committee (PSSC), a standing committee of the QCGN board composed of community leaders with expertise across various fields that is representative of Quebec’s English-speaking minority community, was handed this important task and has been working diligently over the summer and fall of 2018. With support from the QCGN, the PSSC undertook a two-phase consultation process that included two community-wide surveys, five focus groups, a two-day sense making session with community experts, countless individual conversations, as well as several meetings of the PSSC and affiliated subgroups. Phase one generated a report that summarized key principles and priorities for action, and phase two generated recommendations for a funding distribution framework. A comprehensive second report, which is currently being drafted, will present the Department of Canadian Heritage with final recommendations on both principles and priorities for action as well as a distribution framework for these funds. 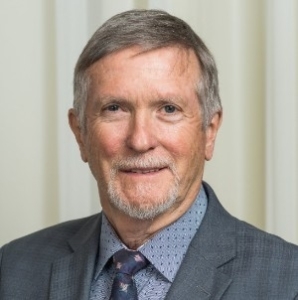 PSSC chair Gerald Cutting said members of the priority setting committee felt strongly that they needed to produce a report the entire community could see themselves reflected in. He said the result of all the PSSC’s consultations spoke to the need in communities for this new funding. Last week members of the PSSC met with senior officials of Canadian Heritage to discuss its preliminary findings. “Canadian Heritage commended the committee for its work and recognized the effectiveness of the process whilst looking forward to final recommendations,” said QCGN’s Director General Sylvia Martin-Laforge. She said the phase two report is expected to be tabled at a special QCGN board meeting in the next couple of weeks before a final report is submitted to the Minister of Official Languages Mélanie Joly. Quebec’s English-speaking minority communities experience large gaps in service provision, said Cutting. “Our communities are lacking the breadth of support offered to French-speaking minorities outside of Quebec,” he explained. He added that our communities also frequently do not hold control of our institutions and do not have adequate policy support in many areas. 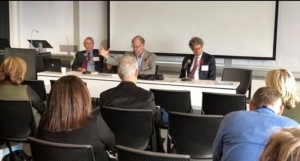 On Thursday, October 25, QCGN Board Member Christopher Neal, and the Quebec English-language Production Council (QEPC), represented by Kenneth Hirsch, Arnie Gelbart and Kirwan Cox, presented to the Yale Panel which is studying changes to Canada’s broadcasting and telecommunications laws and regulations. One of our main goals is increasing resources available for the creation of English content. The Canada Media Fund (CMF) dedicates a percentage to the production of French official language minority production but has no reciprocal arrangement for English-speaking Quebec. This review was initiated in June in response to new challenges and opportunities facing Canadian broadcasting and telecommunications, including content creation in the digital age, net neutrality, cultural diversity and the future of Canadian media and Canadian content. The review is being led by a panel of external experts, chaired by Janet Yale, which is collecting the views of stakeholders. The panel is looking at four themes: reducing barriers to access by all Canadians to advanced telecommunications networks; supporting creation, production and discoverability of Canadian content; improving the rights of digital consumers; and, renewing the institutional framework for the communications sector. Our community’s delegation, which appeared before the panel on Oct. 25, outlined concerns, expectations and recommendations for the upcoming legislative review. The next step in this process is for QEPC and ELAN to liaise with Francophone stakeholder groups like the Fédération culturelle canadienne-française (FCCF), to coordinate official language minority community positions before submitting an official position. It’s not too late to have a say. The deadline for written submissions to the Yale Panel has been extended to Jan. 11. Assisting young people by enhancing their education with practical training and getting at-risk youth local work experience can strengthen their well-being and strengthen Quebec’s English-speaking communities. These goals are at the heart of two projects by the Council for Anglophone Magdalen Islanders and Voice of English-speaking Quebec that are providing educational and work opportunities for youth in the Magdalen Islands and Quebec City. Selected for their innovation and sustainability, these are among the 10 programs sharing in a $1 million Community Innovation Fund, provided by the federal government’s Social Partnership Development Program. The fund is managed by the Quebec Community Groups Network. The Magdalen Islands, a five-hour ferry ride from Prince Edward Island, is home to one of the most isolated English-speaking communities in Quebec. It has 675 residents who, in the 2016 Census, gave English as their mother tongue, or 5.7 per cent of the total population. “We’ve been here since the 1800s and most of the population are fishermen or employed by the fishing industry,” says Helena Burke, executive director of the Council for Anglophone Magdalen Islanders (CAMI), created in 1987 to defend the rights of English speakers. It has since expanded its role to improving the quality of life and vitality of the community, Burke said. The need to expand employment possibilities for young people is a way to maintaining population levels. The prospects are revealed in the declining school population, reflecting much smaller families and departures to the mainland. Burke recalled that when she graduated from high school in 1997 there were 100 students from pre-kindergarten to Secondary V compared to the current total of 45 students. The decline in numbers underlines the importance of programs to encourage youth to find reasons to stay, she noted. More than 90 per cent of English speakers live in Old Harry, Entry Island, or Grosse Île, where Burke grew up and still lives. She has been CAMI’s executive director for 12 years. With its $105,000 grant over two years from the program, supplemented by some local funding, CAMI’s youth program began in June 2017 with two main objectives – to expose young people to careers other than the fishery and use local human resources to provide skills training and possibly future employment. As Burke noted, they already know how to fish. One of the mentoring programs teaches how to build fiberglass boats, which can be useless and profitable during the long winter. Three local firms are always looking for skilled labour. “They’ve got a waiting list a mile long for new boats,” Burke said. Under the program, students also are taught carpentry and small-motor repair. “These are useful hands-on skills,” Burke said. “You might fish for two or three months of the year, but the rest of the time you could be using trade skills,” she added. A total of four students had remunerated work, with the focus on boat building. This year the program is incorporated into the regular high-school curriculum, the course where students learn about career options. Since it’s part of the school program, students were not paid. The focus was on carpentry. 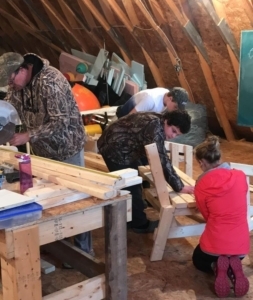 “They started building benches and will sell them to the community and the money collected will be re-injected into the program to buy materials,” Burke said. Students also built a greenhouse and garden boxes and were taught how to use them to grow vegetables. The project will be looking for additional funding when the fiscal year wraps up March 31. In Quebec City, the Voice of English-Speaking Quebec (VEQ), founded in 1982 to advocate for and strengthen the community, was awarded a total of $123,640 over two years for its innovation project. Initially the project was designed to foster employability skills for special-needs youth, in partnership with local businesses. It was judged to be the kind of innovative program that was necessary and not available for this community of 15,270 English speakers. 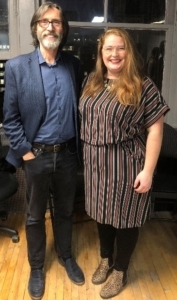 VEQ’s Executive Director Brigitte Wellens explained the clientele soon expanded beyond young people on the autism spectrum or with disabilities to include at-risk youth coping with addictions, socio-economic, family, or mental health issues. In its first year, the project offered 10 work opportunities for four special-needs youth and placements for nine this year so far, project coordinator Dominique Paddack said. The age range is 16 to 26, and the first work opportunities were in community events such as festivals and the Christmas hamper campaign. “One high school student got to work 20 hours a week with a residential cleaning company, which gave him eight months of experience last year. 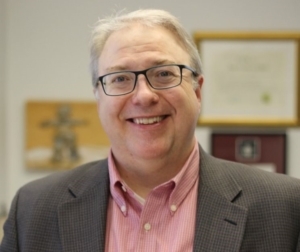 Now he’s on to something else – a good example of our making a link with a firm that needed workers and through a social worker at one of the local high schools, to find a part-time opportunity for a student.” The program subsidized the student’s work. As well, four special-needs youth have been employed since June at an annual book fair, sponsored by the Eastern Quebec Learning Centre, an adult vocational education centre in the city’s Ste. Foy borough. The money raised at the book fair was given to the Special Needs Activities and Community Services Entrepreneurs (SNACS) for its activities. The work included sorting and labelling some 25,000 books that were offered for sale. 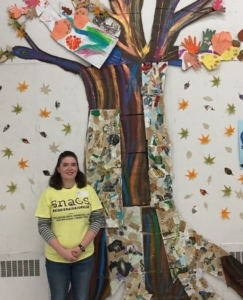 “This type of project gives these students work experience, the chance to earn money, builds their self-esteem, and helps with their socialization,” Paddack said. Some participants may have difficulty speaking French and so these opportunities enable them to work in English. Wellens noted that once special-needs youth are out of the school system, and after the age of 21, there are no more services for them. The project fosters employability skills training for special-needs youth. It encourages on-the-job training in their language of choice and enhances their capacity to fully contribute to their communities. The project is developing new partnerships with local businesses, helping to improve the socioeconomic security of this vulnerable population group. This is the fourth in a series of articles about projects that were funded under the Community Innovation Fund. For further information about the CIF please contact Christine Boyle at 514-868-9044, ext. 257. October marked a milestone for QCGN member and Community Innovation Fund recipient, Phelps Aide Phelps Helps. On Oct. 26, Phelps hosted its first formal annual general meeting at its office in Stanstead (272 Dufferin St.) with more than half of the 42 new active members in attendance. 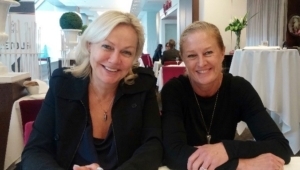 Co-founders Catherine Van der Linden and Jeanie Markwick were thrilled to announce that the Canada Revenue Agency had awarded the organization charitable status. After months of hard work, this designation culminates a pivotal realization to achieving the organization’s long-term goals. The AGM was also a time for Phelps to provide an overview of the past year’s work and achievements. 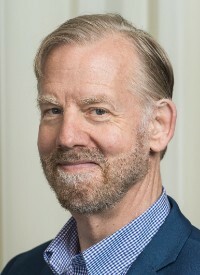 The 2017-18 year was one of growth in all aspects: the team grew from four members to seven; volunteer numbers increased to 54; partnerships more than doubled reaching 70 contributors and collaborators; program participation increased from 100 individuals to 160; and even their location underwent significant renovation to accommodate the growing numbers. Executive Director Katie Lowry presented these highlights and more to the members and emphasized that at the heart of Phelps is the quality and enthusiasm of the team and their willingness to do whatever it takes to achieve their participants’ success through now nine designated programs. The board added that the formula works because Phelps Helps supports each participant on an individual path to academic and personal success while instilling the importance of community engagement and teamwork. From Oct. 28 – 30, 2018, hundreds of researchers, practitioners, community stakeholders and policymakers gathered at Concordia University for a three-day forum on Minority Community Vitality Through Education. Convened by the Inter-Level Educational Table, a committee of Quebec English-Speaking Communities Research Network (QUESCREN), the objective of the forum was to encourage mobilization around the development of a healthy and sustainable English-language educational offer in Quebec from pre-kindergarten to university that leads to student retention, access to good jobs in Quebec, and a strong sense of identity and belonging. The four keynote addresses were: Education and the Vitality of Official Language Minority Communities by Raymond Théberge, Canada’s Commissioner of Official Languages; The View from Ontario by François Boileau, French Language Services Commissioner of Ontario; Strategic Initiatives for Minority Language Education in the European Union by Colin Williams, Cardiff University, University of Cambridge; and The English-Language School System in Québec: Who Cares? by Kate Le Maistre, Advisory Board on English Education. Presentations addressed themes ranging from early childhood education and culture to English- Quebec studies in the university curriculum. 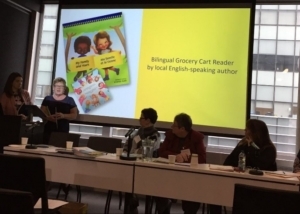 The diversity of Quebec’s English-speaking communities was reflected in topics and speakers reflecting regional, indigenous, ethno-cultural, and visible minority communities’ realities. Among other outcomes, participants obtained increased awareness of the education system’s role in building community identity; new opportunities to network and collaborate and; knowledge of community socio-economic realities including poverty, and networks and resources that can be mobilized to address them. A summary report reflecting the key themes, successful practices and strategic recommendations that emerged from the forum will be publicly available in the new year. What the organizers can say for now is that participants gave some very positive feedback in the post-forum evaluation survey, and ILET hopes to create a second forum in 2020. The conference program, speaker list and registration page may be viewed here. Historically, French-language schools outside of Quebec have been important cornerstones of Francophone community vitality. This has taken on even more significance since the adoption of the Canadian Charter of Rights and Freedoms in 1982 and the subsequent expansion of French-language schools across Canada, along with recognition of community management and control of educational instruction and facilities. Quebec’s English-speaking community has not had the same experience. English-language schools have been well-established in communities throughout its history, so there has been no need to strengthen the ties between the community and its educational institutions. So, what now? What about your collective community, which is a much younger minority in spirit and self-awareness than the French-speaking minority communities outside of Quebec? In my view, the increasingly accepted view that schools and school boards have a certain responsibility in terms of broader community vitality is a sign of growing political maturity and policy sophistication. The past 35 years’ experience of French-language schools outside of Quebec may offer some helpful insights—in terms of community vitality—for the future of English-language schools in Quebec. As most of you know, thanks to the 1982 Charter, hundreds of thousands of young French-speaking Canadians outside of Quebec have had the opportunity to go to school in their language, something that was difficult to do in the past and, despite the progress that’s been made, continues to be an issue in some regions even today. Cases taken to court by official language minority communities play an essential role in defining and defending language rights in Canada. Over the years, court cases involving education rights—such as Mahe, Arsenault-Cameron, Doucet-Boudreau, Solski and Rose-des-Vents—have helped define the scope of the rights of the communities concerned. For example, let’s look at the Supreme Court of Canada’s 1990 decision in the Mahe case. The Court recognized the right of parents belonging to the linguistic minority to manage their own educational institutions where numbers warrant. This decision was an important milestone in the development of French-language minority communities because it clarified the scope of their right to have their own schools and to manage them. Another example is the Doucet-Boudreau case, in which the Supreme Court of Canada retained its jurisdiction to monitor the Nova Scotia government’s progress in building a French-language school. More recently, in the case involving the French-language school in Saint-Paul-de-Kent, the Court of Queen’s Bench of New Brunswick denied the decision of the former Minister of Education and Early Childhood Development to close the school, ruling that the right to do so rests with the school board. What happens next remains to be seen, as the provincial government announced that it will appeal the decision. Closer to home, in Quebec, we’re seeing how the relationship between schools and communities is changing. In addition to the recent changes to the history curriculum, there was also the tabling of Bill 86 by the then Liberal government in December 2015, which proposed to eliminate school board elections in their current form. Education advocates reached out to the communities for help in protesting against the bill, and QCGN was instrumental in helping to mobilize community and media opposition to Bill 86. In May of 2016, the Government of Quebec withdrew the bill. Fast-forward to today, more than two years later. The Liberals were defeated in the Oct. 1 election and have been replaced by François Legault’s Coalition Avenir Québec (CAQ). And the new majority CAQ government has publicly said that it wants to abolish school boards altogether and replace them with service centres, controlled by parents. I trust, however, that this is an issue that will once again see education advocates working together with the communities in the shared interest of community vitality in its broadest sense. In the interests of fairness and prudence, I will wait until the new government releases more detailed information before commenting further. 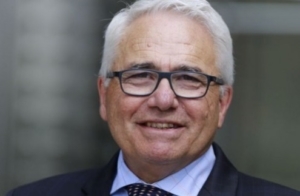 Read Commissioner Théberge’s full speech. the vitality of the English speaking Minorities of Quebec and the crucial role the QDF will play in this for years to come. 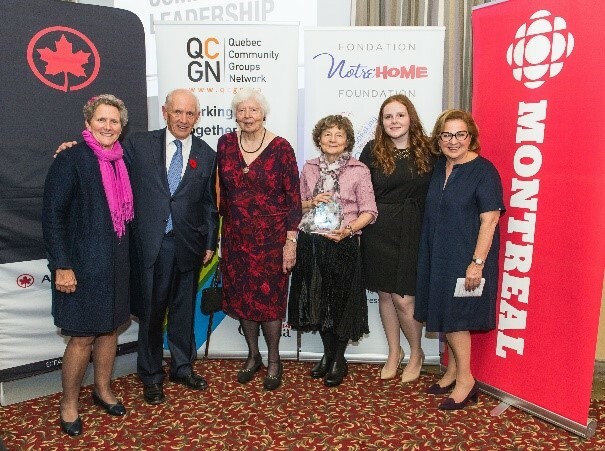 The Quebec Community Groups Network celebrated the 10th anniversary of its community award program on Nov. 1, recognizing three community leaders and a young Quebecer who’ve made significant contributions to the English-speaking community in the province. Olga Melikoff, Murielle Parkes and John Rae received the Sheila and Victor Goldbloom Community Service Award. 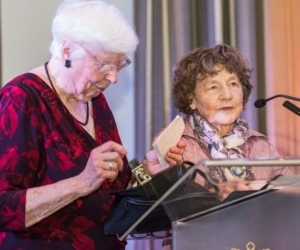 The Goldbloom award celebrates individuals who, like the award’s namesakes, have dedicated their lives to ensuring English-speaking Quebec remains a vibrant community within Quebec and Canada. For many years Sheila and Victor Goldbloom invested their talents and skills for the betterment of the community and inspired others through their contributions. The Young Quebecer Leading the Way Award, which is sponsored by Quebec Community Groups Network, the Fondation Notre Home Foundation and CBC Quebec, recognizes and celebrates the outstanding achievements of young English-speaking Quebecers who are engaged in innovative initiatives that create change in our communities. This year’s youth leadership award was presented to 23-year-old Hayley Campbell. In 1963, Olga Melikoff and Murielle Parkes along with their friend the late Valerie Neale, set out to create a French immersion program at Margaret Pendlebury Elementary School in St. Lambert. The province was changing, and they knew that if they wanted their children to have a good future in Quebec, they needed to be able to speak French. In a tribute video produced by CBC, Melikoff said that the school boards were not behind the idea at first because “it was threatening to them.” She said they told her that if she wanted her children to be educated in French, they should go to the French board. “Originally they said, ‘We can only give you a piece of the pie,’ and we said, ‘Well we want a different pie,’” Parkes added. The three did not give up, and their effort changed the face of English-language public education across Canada and helped forge linguistic duality into a defining characteristic of our nation. Advocacy for French immersion programs in English school boards was a “real community effort,” said Melikoff. But she singled high-profile Montreal Neurologist Wilder Penfield who supported them. “He wrote us a four-page letter and that meant a lot because a lot of people thought there were a lot of problems with the program, for example, students will lose a year, they’ll have psychological problems,” she said before reading parts of his letter. John Rae, a long-time Liberal Party adviser, community advocate and philanthropist, was recognized for his commitment to public service. He’s been involved with many philanthropic causes from education, music and the arts, athletics, social services and youth. 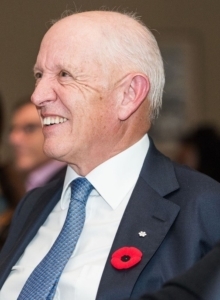 In health care he helped to develop and implement a strategy to raise $300 million to build the new McGill University Health Centre (MUHC) hospital at the Glen site. Rae said he was humbled because he was in the same category as Parkes and Melikoff. 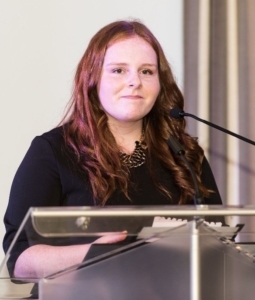 Shawville resident Hayley Campbell, winner of the 2018 Young Quebecers Leading the Way Award, said that the future of Quebec is opening and welcoming and that her generation is willing to make change. Comedians and musicians Bowser and Blue performed at the awards ceremony, poking fun at Quebec and federal politics with a song about the Bonjour/Hi controversy and an accurate impression of former prime minister Jean Chrétien. Rae, who worked with Chrétien for years, said he will be reporting back to him about Bowser and Blue’s presentation. “But knowing him the way I do, he would enjoy that presentation more than anybody,” he said. 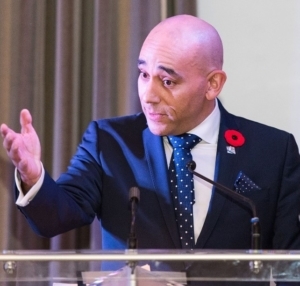 Ste-Rose MNA Christopher Skeete, parliamentary secretary to Premier Francois Legault, who is responsible for overseeing the province’s Secretariat for relations with English-speaking Quebecers, attended the ceremony and made introductory remarks. Other VIPs in attendance included Liberal Opposition leader Pierre Arcand along with MNAs Kathleen Weil, Gregory Kelley and Jennifer Maccarone. Dozens of community leaders and stakeholders were also on hand. Over the last 10 years, 32 individuals have won the Goldbloom Award and four youth have won the Young Quebecer Leading the Way Award. Since 1995, the Community Christmas Hamper Campaign has been delivering goodness to over 200 homes in the Quebec City region during the holiday season. The organizing committee of this annual initiative is composed of representatives from 18 organizations from the local English-speaking community, including QCGN member groups Voice of English-speaking Quebec, the Literary and Historical Society of Quebec (Morrin Centre), and Jeffery Hale Community Partners which coordinates the campaign’s central registry of English-speaking community members who need help during the holiday season. For 23 years now, Quebec City’s English-speaking community has been collaborating towards the success of a Community Christmas Hamper Campaign, which distributes more than 200 Christmas hampers to homes in need in the Quebec City region. It’s an an enormous challenge with a most heart-warming outcome. Food: Drop off non-perishable food at one of several sites around town, including VEQ’s Holiday Happy Hour at the Morrin Centre on Wednesday, December 5. Money: Write a cheque, give cash, or donate online towards the $30,000 annual objective. Funds buy fresh produce and other goods to supplement donated items. Time: Help collect, sort, pack or drive: There are a variety of tasks that need volunteer power right up until delivery day on December 15. For more details about how you can contribute, please visit qchampers.ca, email give@qchampers.ca or call Hamper Headquarters at 418 684-5333, ext. 1474. Share your giving or receiving story on Facebook or Twitter at #qchampers.